Stanley Johnson had 13 points and six rebounds off the bench as the Pistons overcame first- and third-quarter deficits to snap their five-game losing streak. BENCH BOUNCES BACK – One game after their worst performance of the season in a loss to Miami, Dwane Casey’s bench saved the Pistons. Twice. The Pistons dug holes for themselves with sluggish starts to each half but closed both the first and third quarters with rallies to get back in the game. They trailed 31-16 before a 10-0 run in the final minute of the first quarter pulled them within five. They eventually went ahead by 10 and led by seven at halftime, but quickly fell behind by 11 points as Orlando went on a 27-9 run to open the quarter. But a 7-0 run in the final minute of the third quarter drew them close and Casey’s bench – led by Stanley Johnson and Langston Galloway – turned the game around. All five of Casey’s bench players used – Johnson, Galloway, Jose Calderon, Zaza Pachulia and Ish Smith – had plus/minus numbers ranging from plus-14 to plus-18. Turnovers, a recent bugaboo, again undermined the Pistons early in another in a series of sluggish starts. 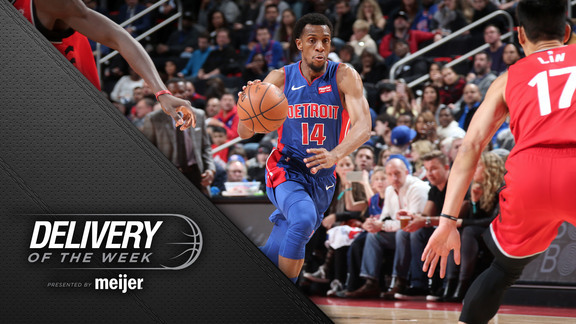 Johnson finished with 13 points, six rebounds and three assists – the last one was a beauty, passing up a three to swing it to Galloway, whose triple put the Pistons ahead by seven in the fourth quarter – while Galloway went 4 of 8 from the 3-point arc to finish with 12 points, six rebounds and three assists. Casey’s bench outscored Orlando’s 36-20 with 15 of Orlando’s points coming from Terrence Ross. BULLOCK BACK – The Pistons got Reggie Bullock back after he’d missed the past 2½ games with a sprained ankle. But it wasn’t the Reggie Bullock they hoped to get. His early-season slump – compounded by an illness that cost him one game and asprained ankle that cost him the past 2½ games – struggled to get anything going. He missed all six shots and was on the floor for the two sluggish stretches in the first and third quarters. Bullock started along with Glenn Robinson III, who on Monday replaced Stanley Johnson as the starter at small forward. Orlando’s defensive matchups called for smallish point guard D.J. Augustin to guard the 6-foot-7 Bullock and athletic small forward Wes Iwundu checked Pistons point guard Reggie Jackson. In his first stint covering seven minutes, Bullock looked like a guy who hadn’t played in a week. His first shot came on the team’s first possession – an open corner three that he’d typically drain but it came up short. He missed a driving layup and committed an early turnover on a pass that resulted in an Orlando layup. His only point came when he took the free throw as Orlando got called for a defensive three seconds. DRUMMOND DOMINANT – Andre Drummond went into the game with four 20-20 games this season – at least 20 points and 20 rebounds – which was three more than the rest of the NBA combined. He came out of it one rebound shy of his fifth 20-20. Drummond had 23 pints to go with his 19 rebounds. Drummond had 19 points and 12 rebounds in the first half on 8 of 10 shooting, making both of this free throws, and was a big part of the Pistons holding Orlando to 20 second-quarter points. In fact, the Magic scored 31 points in the first 10:35 of the half and then scored just 20 in the final 13:25. Drummond’s banked triple off of an inbounds pass with a half-second left in the first quarter halved a six-point deficit. The Pistons, led by Drummond, wound up with a 50-40 rebound edge over Orlando and had 14 second-chance points. Blake Griffin added 20 points, five rebounds and three assists.